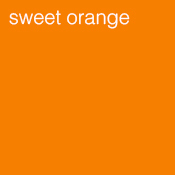 The Sweet Orange is thought to have come from southern Asia, although the name has roots from Sanskrit (nagaranga), and Arabic (naranj), hence the name ‘orange’. It was introduced to Europe in the latter part of the 15th century, and thence to America by Columbus, second time around in 1493. It was growing abundantly in St. Augustine, Florida by 1579, and must have been brought there when the settlement was founded in 1565, or very shortly thereafter.This oil comes from the skin of the instantly recognisable fruits with the colour of the same name, although a finer distillation is made from the flowers. It is the flower distillation that is actually one of the main ingredients in Eau-de Cologne and is properly called Neroli. Orange water made from steeping the flowers is used in cookery (makes for really crisp biscuits) and skin care. 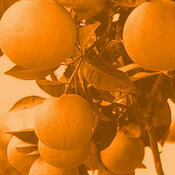 Curacao, the liqueur, is manufactured from what are called Orange Berries – the unripe tiny fruits of the tree. The tree itself is small at around 25-40 feet in height and now grows in warm countries around the world. The green leaves are oval-long shaped, and the fragrant, white flowers grow in small clusters on the new growth.